The Hadoop Development Tools (HDT) is a set of plugins for the Eclipse IDE for developing against the Hadoop platform. Currently we are in the process of porting the existing MapReduce tools from the Apache Hadoop project to allow working with multiple versions of Hadoop from within one IDE. Come get involved as we move towards our first release! This project is currently a member of the Apache Incubator, so check back for updates, or come join us [email protected]. Extract to a local directory (say, 'C:\hadoop2x-eclipse-plugin'). Open '<hadoop2x-eclipse-plugin-directory>\src\contrib\eclipse-plugin' in the Command prompt. Installation directory of Eclipse IDE. Note: Internet connection is required as 'ivy-2.1.0.jar' will be downloaded. On successful build, 'hadoop-eclipse-plugin-2.2.0.jar' will be generated inside '<hadoop2x-eclipse-plugin-directory>\src\contrib\eclipse-plugin'. Copy this jar and paste it to the 'plugins' directory of your IDE. Restart the Eclipse IDE if already started. Otherwise start it. Goto Window --> Open Perspective --> Other and select 'Map/Reduce' perspective. 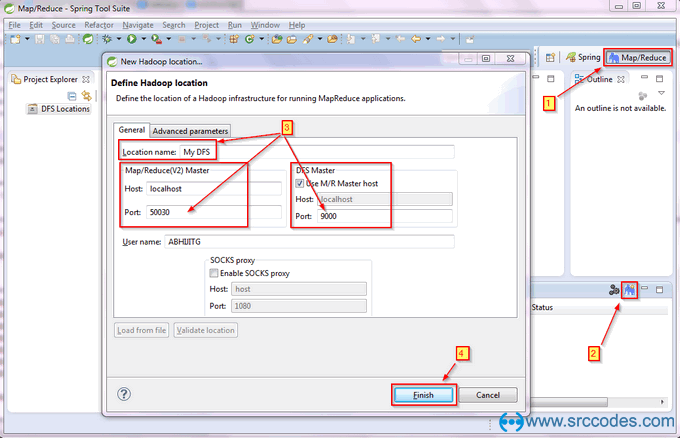 Click 'New Hadoop location...' (Blue Elephant icon) and define Hadoop location to run MapReduce applications. Click 'Finish' button. Address of the Map/Reduce master node (The Job Tracker). Address of the Distributed FileSystem Master node (The Name Node). To know the 'Port' numbers, start Hadoop and open http://localhost:8088/cluster in a browser. Click Tools --> Configuration and search for the following properties. 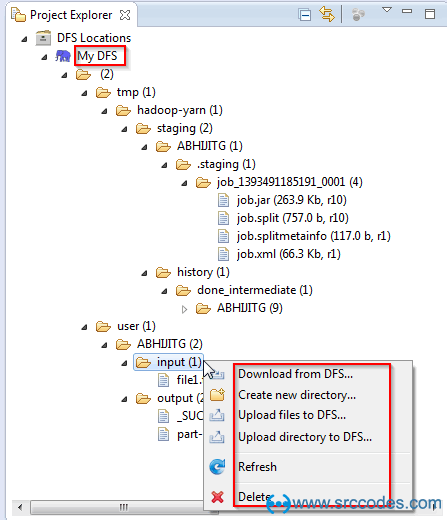 Now we can browse the Hadoop file system and perform different files / folder operations using the GUI only. 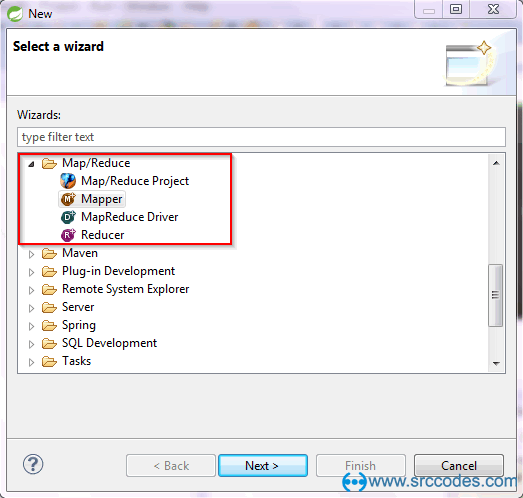 Also, we can easily create Map/Reduce Project, Mapper, Reducer and MapReduce Driver using the wizard (File --> New --> Other... --> Map/Reduce) and jump into Hadoop programming.